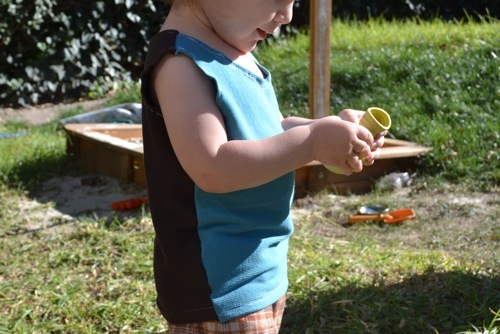 This baby tank top pattern is easy to sew and so very comfy for hot summer days. 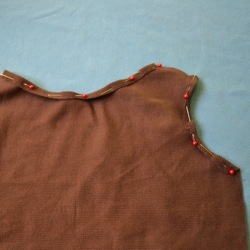 It is made from just two pieces of jersey knit fabric if you simply hem the edges. You can also use contrast trim for the edges. A note about sizing: This is for stretch fabrics only, like cotton jersey (aka - tee shirt material) and the size will vary depending on your finishing method and amount of stretch. 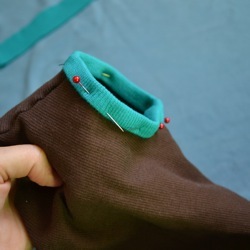 If you trim the edges with contrasting bias trim and put the stretch of your fabric across, it will fit up to 3T. If you fold the edges under to hem, it will be an 18 month size. This is a great project to use XL thrifted tee-shirts as your material. You could even dye the cotton first! In the photo above you can see the sizing difference. These were made with this same pattern only the one on the right was trimmed and it is a little too big on my 18 month old. It actually fits my four year old pretty well. The one on the left had the edges turned under and it fits my 18 month old perfectly. 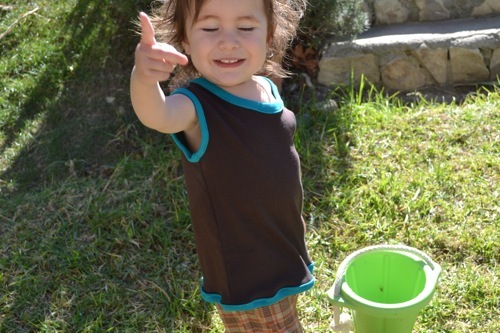 Here is the Baby Tank Top Pattern PDF for you to print out. It is two pages. For your personal use only. You'll notice that it is cut on the fold of your fabric and that it has both the lower front neckline and back neckline detailed on a single sheet. 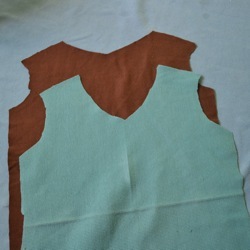 For the smaller sizes, cut out your two pieces and fold under the arm holes and the neckline and bottom and sew. This is the easier and faster method of the two! I used two different colors for the front and the back for my 18 month tank. 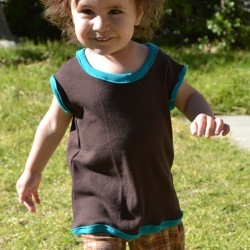 For the larger sizes, add contrasting trim to the edges! 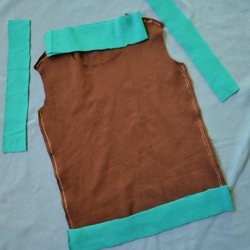 You can even add length and turn this into a tank dress really easily. I think the trimmed version looks like those sleeveless shirts from the 70s. Pretty nifty. Happy summer sewing! Go to the Baby Clothes Patterns Section for more fun ideas! 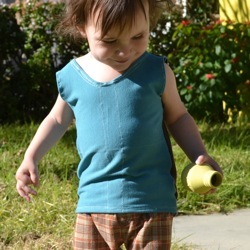 Back to the top of the baby tank top pattern page.